So What Does an Average American Want in a Farm Bill? I am really proud of our undergraduate research program at Mississippi State. This past year Alba Collart and I mentored Shea Gould an undergraduate researcher who has now joined our Department as a grad student. In her undergraduate research she asked a representative sample of 465 U.S. adults their preferences for allocating funds to the programs authorized in a farm bill. The survey focused on four broad categories of USDA spending – farm programs, conservation, nutrition, and a broad category subsuming all other USDA activities. As Farm Bill conferees meet, the House of Representatives and Senate Bills are estimated to spend near current levels over the next ten years — essentially a zero-sum game of shifting priorities. Consistent with the zero-sum game being played in Congress right now, we asked respondents to reallocate the USDA pie rather than shrinking or adding to USDA spending. We find the average U.S. adult. U.S adults desire to spend about the same as currently spend supporting farmers – in fact they support a slightly increased shared of the total USDA budget – from 18 to 19%. Though slight in percentage terms, this increase corresponds to an annual increase of $1.4 billion. 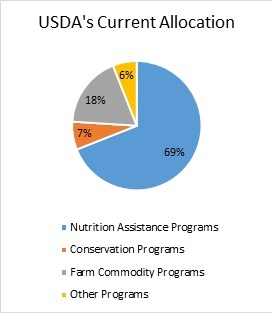 American adults desire to see USDA spending a smaller share of its budget on nutrition assistance programs. Reductions in nutrition spending were reallocated to the other three categories. Even when a subset of survey respondents were shown current levels of spending on nutrition programs they still wanted to spend less, but chose to cut less. Interestingly, spending on nutrition program have dropped significantly without a legislative change due in large part to an improving economy. 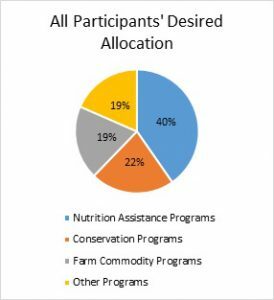 The biggest percentage change desired by American adults is that they would increase conservation programs from 7% to 22% of the total USDA budget. That is a three-fold increase. Our results show that survey respondents primarily wanted to take funding from nutrition programs. Finally, the survey findings indicate a desire for increased spending on “other programs” which were summarized as encompassing research, marketing and regulatory activities, rural development, and food safety. Because the survey addressed such a broad set of areas, it did not dig deeper into desired spending in subcategories. We hope to do follow up research on what was in the ‘other program’ category that led to a desire for increased funding?